Thanks to the bacteria parsing wastewater in the Wastewater Treatment plant, the impureness in the wastewater was cleaned and the treated water was prepared to be discharged to the receiving environment. Our Package Wastewater Treatment Plants were designed according to the SBR (Sequencing Batch Reactor) System and scaled so that the filling, ventilating, sedimentation and discharging stages are completed in a single reactor. The domestic wastewater in the recreation area first arrive at the supply station by gravity and then transferred to the balancing pool by a submersible Initial Supply Pump with time and level controls under a specific automation. Then it is transferred to the Package Wastewater Treatment Plant by a submersible Initial Supply Pump with time and level controls under a specific automation. 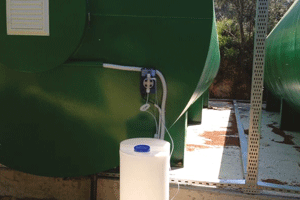 The oxygen needed for the activated sludge in the package wastewater treatment plants is supplied by a blower. The transfer of the air supplied by the blower to the activated sludge in a dissolved form is performed by the membrane-type diffusers. Treated and cleaned in the package wastewater treatment plant, the water is transferred to the treated water tank by the Treated Water Discharge Pump and thus removed from the system. Sodium hypochlorite (liquid chlorine) is added to the treated water by a Chlorine Dosing Pump for disinfection of the water. 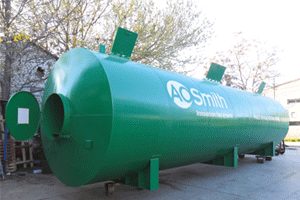 This system, designed by our A.O Smith engineers, prevented significant organic pollution in the most effective manner. 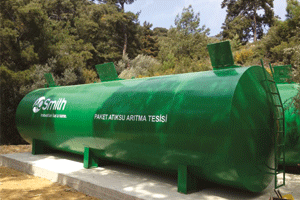 Our project was designed and manufactured in our facility in Izmir/Turkey and transported to Yamanlar, Izmir, Turkey. Following the onsite installation, necessary checks and staff training by expert A.O. Smith engineers, the system was commissioned.